The FEI is seeking new powers over rider suspensions and yellow cards. A widespread review of many legal processes will be debated at the FEI Sports Forum. Now the FEI seeks powers to delay the start in certain cases “to deal with those disciplines that have ‘off seasons,’ in order to ensure that the suspension has a real effect.” There have been a number of cases in recent years where an endurance rider has been suspended for six months towards the end of the winter season in the Middle East – the region with by far the worst doping record – and so is back in action by September, in ample time for the next. The new process would align FEI with many horse racing authorities, who can dictate when a suspension is served so that, for instance, the jockey misses an important race. A widespread review of many legal processes will be debated at the FEI Sports Forum on Monday (April 15), dealing with grey areas that have emerged in recent years. There are glaring variations in the way welfare issues are assessed by the different disciplines. These were highlighted last weekend with social media furore of the endurance “severe tack” incident. new scales of punishment for horse abuse, depending on its severity. 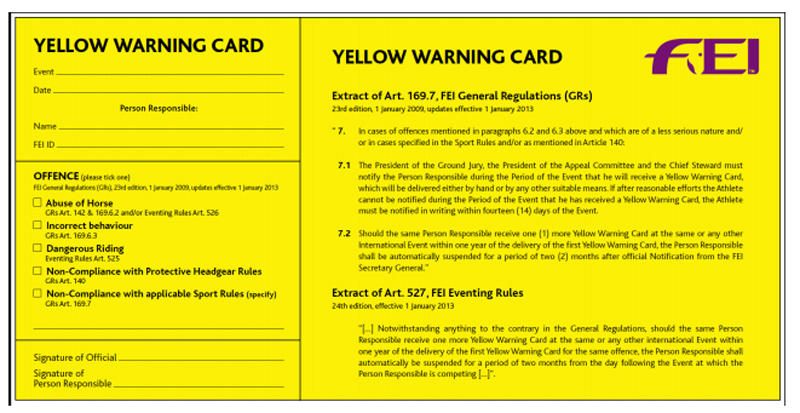 There will also be a discussion about whether rider should be responsible and handed a yellow warning card for offences by his “support personnel” (such as grooms, owners, trainers) and the use of video evidence, especially when recorded on personal devices. National federations would have to approve changes at the 2019 General Assembly November and the soonest any new sanctions would apply is January 1, 2020.